HILO » Two Big Island airports will receive a total of $1.9 million in federal funding to improve runways and taxiways, U.S. Rep. Mazie Hirono announced yesterday. At the Kona Airport, the U.S. Department of Transportation is making available $1,154,287, Hirono said. The Hilo Airport will receive $761,644 to repair four taxiways, she said. U.S. Sen. Daniel Inouye, who also announced the Hilo money, commented, "This project will result in smoother and firmer taxiways that will not have parts of the pavement breaking and sending debris flying that can cause damage to aircraft." 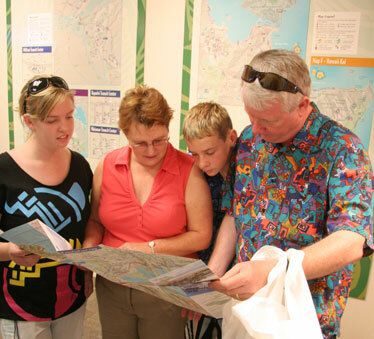 The Farrow family -- Michelle, left, Jessica, Daniel and Martin -- from Sydney, gathered maps for their Hawaii visit yesterday at the city's new information kiosk at Ala Moana Center. The satellite city hall at Ala Moana Center now offers the city's first Information Center in place of the former City Store. The information center includes a computer kiosk for downloading computerized forms, bus route maps and timetables. The satellite city hall is the busiest in the system, with 130,000 transactions annually. The city plans to eventually put information centers in the Windward and Pearlridge satellite city halls, said Mayor Mufi Hannemann. Judges now have the authority to decide whether someone convicted of violating a domestic abuse temporary restraining order or protective order will be placed under electronic monitoring supervision. A bill allowing such discretion was signed into law yesterday by Gov. Linda Lingle. The law, Senate Bill 2218, allows the court to determine whether an offender should be required to wear a Global Positioning System device. The court would then set up "geographic exclusion zones," such as a victim's home or workplace. The device would alert authorities if the offender entered an exclusion zone. Defendants would have to bear the cost of wearing the device, estimated at about $4 to $5 a day. There is no fund for indigent defendants, but a judge would be able to forgo issuing the penalty if it is determined to be overly burdensome. HILO » Bank of Hawaii has established a new annual $10,000 grant to nonprofit agencies named in honor of Big Island rancher Herbert "Monty" Richards Jr. The grant will be made to agencies that show "innovative approaches to help improve the quality of life on the Big Island," a bank statement said. A fifth-generation kamaaina, Richards is chairman and trustee of Kahua Ranch in North Kohala, where he has worked since 1953. Richards served on the Bank of Hawaii board of directors from 1989 to 2000, was a regent of the University of Hawaii for 16 years and is a member of the board of the Nature Conservancy of Hawaii. He also served on the Hawaii Commission on Water Management. The deadline for nominations for the new award is Aug. 15. Application forms are at Big Island Bank of Hawaii branches. LIHUE » Kauai's new police chief plans to create an internal affairs unit. The new division would handle administrative review, facility inspections and criminal investigations of Kauai police. It would ensure department policy and procedures are followed. Police Chief Darryl Perry says the Honolulu Police Department's internal affairs commander will help him put the division together. Perry says Kauai police should have had an internal affairs unit years ago. Perry became Kauai's police chief in October. He succeeded K.C. Lum, who resigned. Mayor Bryan Baptiste and the Kauai County Council pushed for Lum's removal amid claims he failed to properly manage the Police Department and improve morale. An 18-year-old man who died Sunday morning when his motorcycle crashed into a guardrail on Likelike Highway near Kalihi Street has been identified as Christian Cambra of Honolulu, according to the Honolulu Medical Examiner's Office. According to police, Cambra was Honolulu-bound when he approached a bend and his motorcycle crashed into the right guardrail shortly after 3 a.m. near the H-1 freeway eastbound ramp and Kalihi Street split. Cambra, who was not wearing a helmet, was pronounced dead at the scene, police said. An 80-year-old man who was critically injured after he was hit by a car in January died Friday. The man had been hospitalized in the Queen's Medical Center since Jan. 14, when he was hit by a vehicle after he darted into a crosswalk at Ahonui and School streets in Kalihi, police said. The man's name was not released. He is the seventh pedestrian killed on Oahu this year, compared with 12 at this time last year. A 22-year-old man was arrested yesterday for allegedly stabbing two teenagers in Kalihi. At about 5:30 p.m., police officers responded to a report of a weapons offense near the intersection of Middle and Kahauiki streets. Police said when they arrived, two males, ages 19 and 15, were found with minor stab wounds. The suspect was located nearby and arrested on suspicion of second-degree assault. A knife was recovered on the suspect. Both teenagers were taken to the Queen's Medical Center in stable condition. Big Island police are looking for the driver of a pickup truck who sexually assaulted a female hitchhiker over the weekend in the Kurtistown area. The man was traveling Puna-bound on Route 11 near Keaau Ball Park in Puna on Saturday night between 10:30 and 11:30 p.m., police said. He picked up an adult female who was hitchhiking alone. The driver turned off the highway onto a dirt road in the Kurtistown area, where he sexually assaulted the victim, police said. Her attacker is described as a heavy-set male in his 30s, about 5 feet 7 to 5 feet 10 inches tall, between 200 and 280 pounds, with very short dark hair, dark skin, hazel eyes and a thick mustache. The truck is described as an older-model, faded, pinkish-gray, full-size four-wheel-drive pickup with large tires. Police ask anyone with information about this case to call officer BJ Duarte at 961-2373 or the Police Department's nonemergency line at 935-3311. A 41-year-old Big Island man who died following a one-car accident in Puuanahulu, North Kona, early Friday was identified as Chenault Bethea of Waimea. Police said Bethea was driving a 1999 Lexus sport utility vehicle on Route 190 at about 12:16 a.m. when he lost control between the 18- and 19-mile markers, went off the road and overturned. He was not wearing a seat belt and was thrown from the SUV, police said. He died later at Kona Community Hospital. Police say speed and alcohol were factors in the crash, according to a Hawaii County Police Department news release.